The SPLASHControl technology ensures a spotless kitchen and the PowerBell Plus technology combined with extra milling blades reduces the need for careful pre-cutting as the stick blender blends whole foods in seconds. The stick blender has 11 speed controls that you can easily adjust on the speed wheel for maximum precision. The powerful and highly efficient 750W motor blends your food just the way you prefer it, and the EasyClick system makes it easy to conveniently change between the accessories. 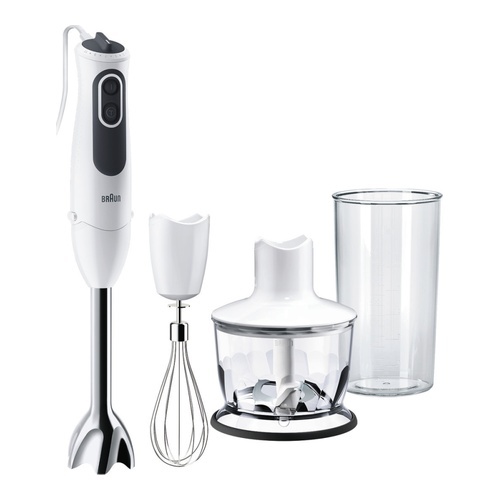 The stick blender comes with a 60 ml BPA free plastic beaker with ml and fl oz measurements, a chopper and a whisk. The stick blender is equipped with an anti-splash design that ensure to keep your kitchen spotless and the PowerBell Plus technology reduces the need for careful pre-cutting as the stick blender blends whole foods in seconds. 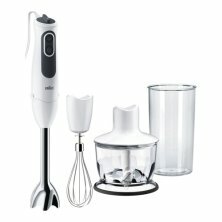 It comes with a 600 ml BPA feww plastic beaker, a chopper and a whisk.